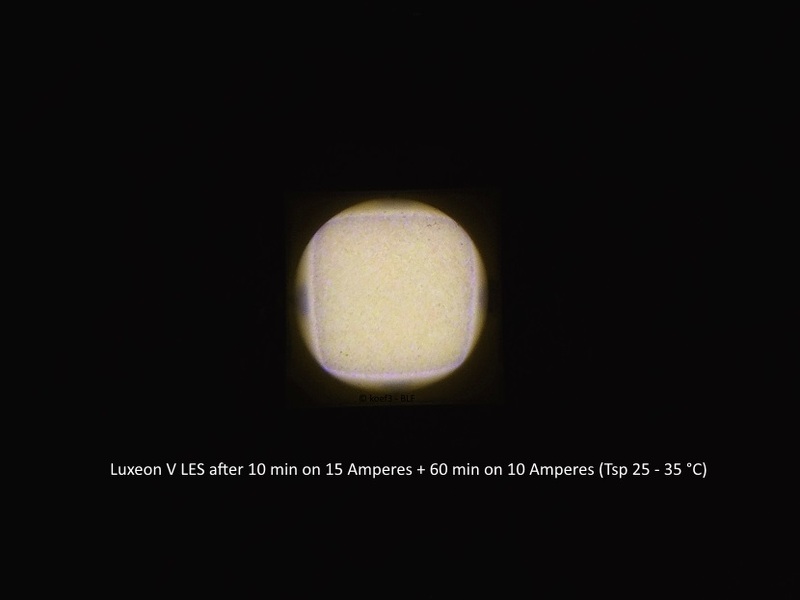 In the first days of LED technology, 2003, Lumileds released the Luxeon V LED. For it’s release it was one of the brightest emitter in the world and offered many manufacturers of lighting systems new possibilites in design and luminous power. Fourteen years later, a new Luxeon V was presented to the public, available in 70 CRI option only. 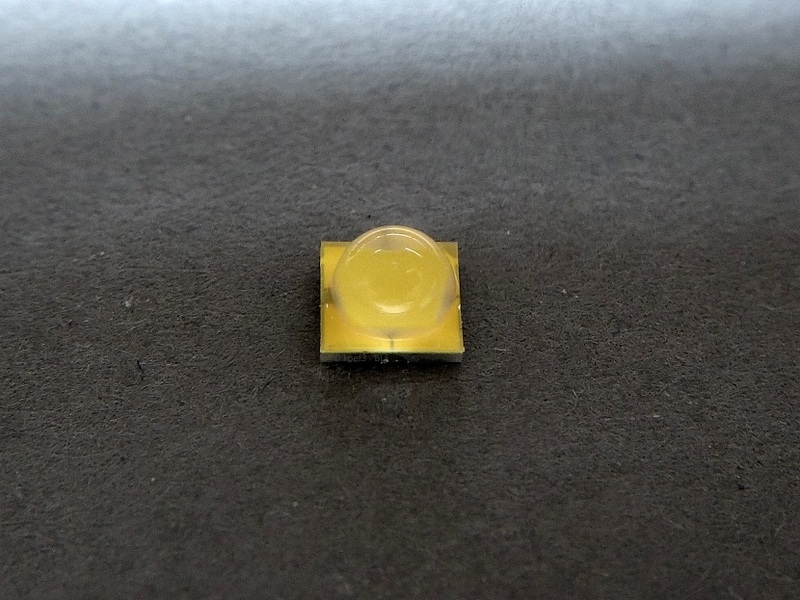 Offered as Chip Scale package (CSP) based emitter and very high efficiency and high power (officially it can powered up to 4,800 mA), it sounds very interesting for directional optics use, like in flashlights. In this big review I tested two samples of Luxeon V out of different suppliers, one from Led4power and one from Mouser – but same CCT and bin. All LEDs are purchased in the last four weeks. Total angle at which 90% of total luminous flux is captured. Mouser doesn't give any further values or specs for voltage / flux bin. 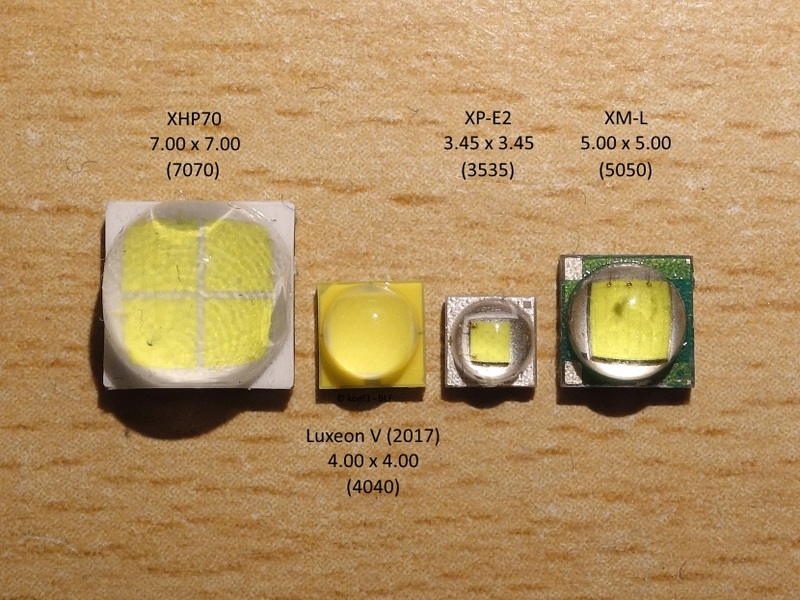 Unless other LEDs the Luxeon V is 4.00 x 4.00 mm in size (commonly referred as ‚4040 size‘). The look is reminiscent of the latest gen Cree LEDs, most of the visible outer surface is yellow-colored, maybe covered with phosphor. 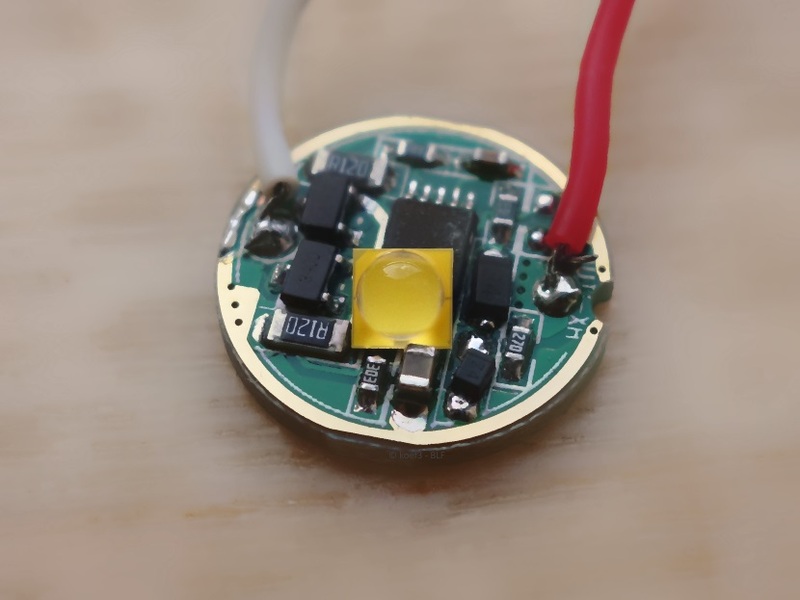 This LED uses a classic silicon dome known from XM-L2 / XP-G2. The footprint is not the same like XP or XM. Also already known from the Luxeon MZ (test here), the size is between the two, which makes the using of industry standard boards more difficult. On XP boards the LED can fit, but not on all. 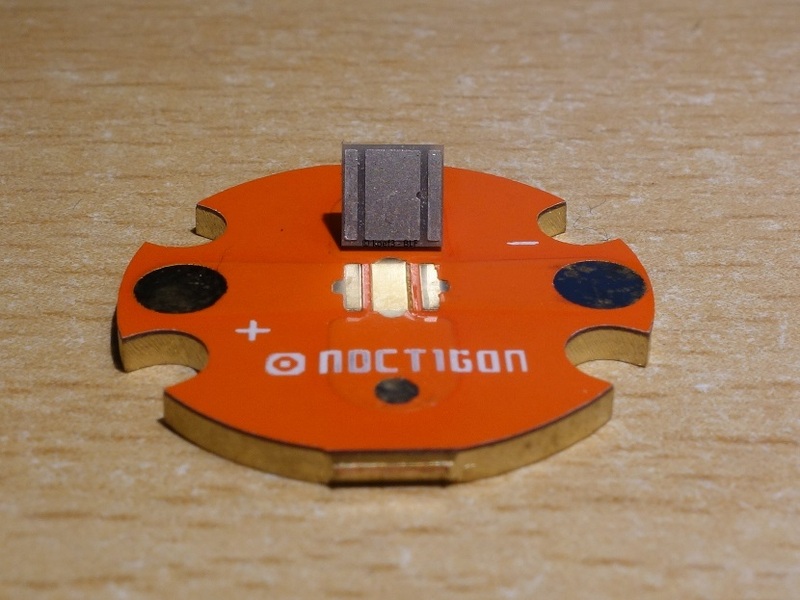 Noctigon boards work but the use of less solder paste is necessary to avoid it squeezing out and shorten thermal pad and anode/cathode in reflow process. Some weeks ago Led4power introduced direct thermal path (4040) boards, in 16 mm size. For sure this LED fits perfectly on this board. But a test on this board shows hat the gain in luminous flux is negligibly small and cannot even be reliable measured. Like the most new LEDs the Luxeon V is built in Flip Chip design. This means that the contacts for anode + cathode lays underneath the LED chip which makes the use of bonding wires known from older LEDs unnecessary. The biggest advantage of this design might be lower production cost and (in most cases) better heat dissipation to the MCPCB. The die on very low current reminds me of the Nichia 219C. 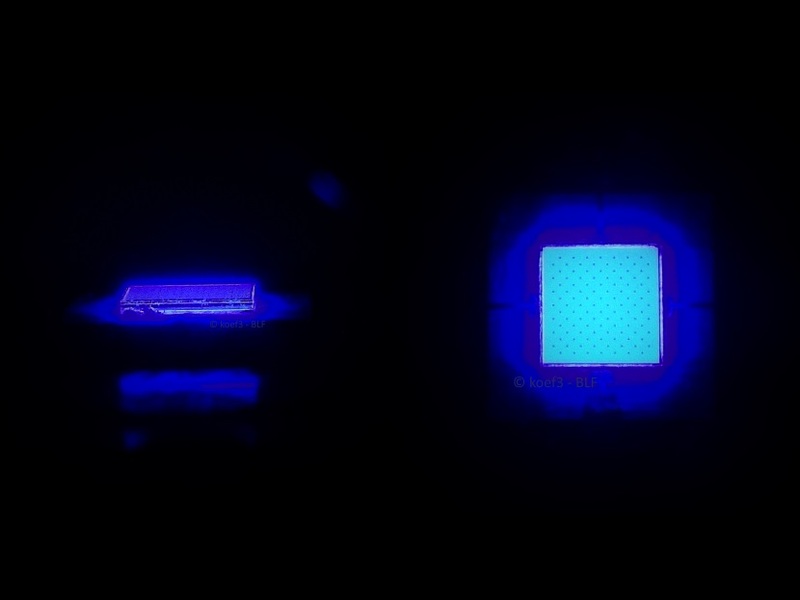 The LES is covered with fine yellow-red-blue dots, but lacks big color differences at the edges (unless other LEDs like XP-L2). This might be a good sign for a nice beam pattern in directional optics, but we would see this later. ... reveals that the package is much bigger than the die (approx. 3.6 times) and if the complete housing is used for the defintion the name ‚CSP‘ might be wrong for this LED. Perhaps the designation applies only to the LED chip itself, but this can not be mounted on a circuit board directly. Or it’s only valid for the emitter with dome on, but this also didn’t meet the definition given by the JEDEC. Personally I assume that the name ‚CSP‘ is only meant for the internal design or leveraging key elements of this package design ('CSP based'), especially in the optimized heat dissipation already known from other CSP based emitters like Nichia E21A. Like other LEDs in Flip Chip design the LED chip emits light to the side too, not only to head-on, which increases the LES significantly and lowers the luminance. 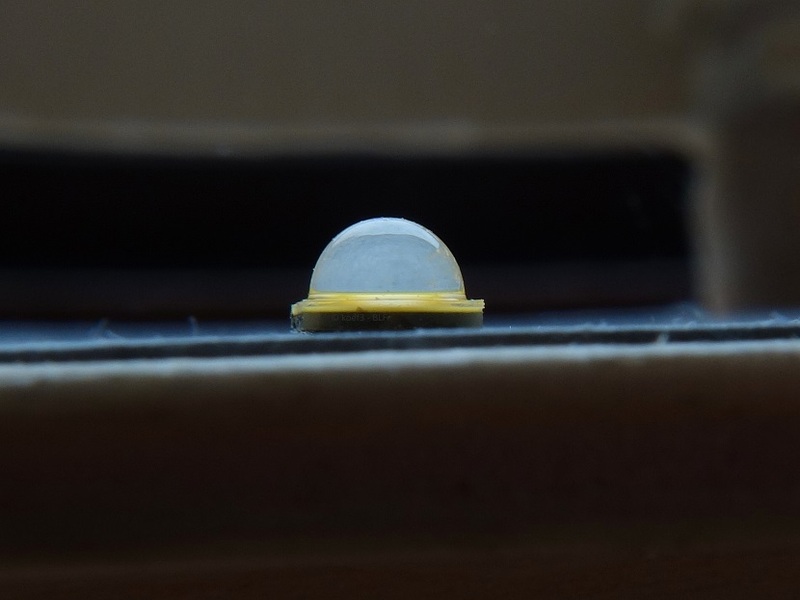 With dome on (original state) the LES is 9.83 mm² (0,01524 sq in) in size. In shaved (dedomed) state, the LES is 6.43 mm² (0,009967 sq in) in size. 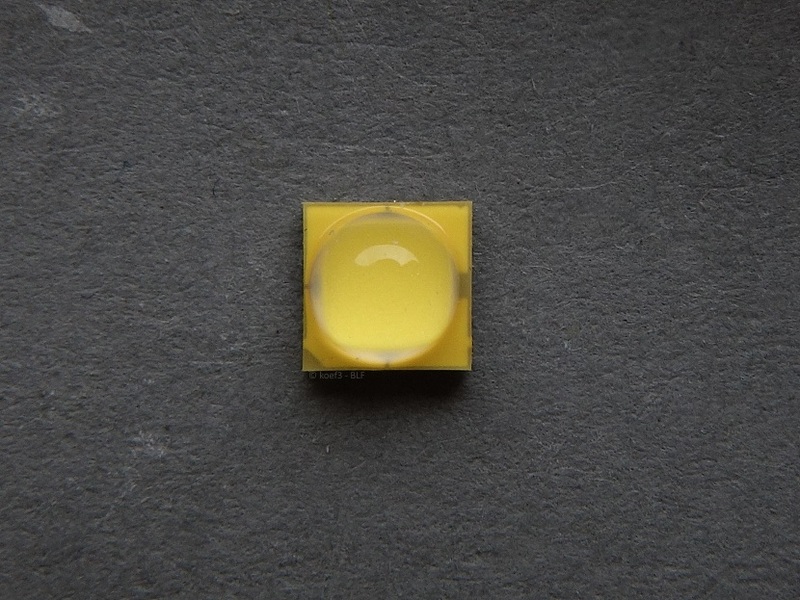 Without phosphor the pure LED chip has a LES of 6.19 mm² (0,009595 sq in). 25 °C Tsp, unless noted otherwise, LED mounted on specially adapted XP20 board. In this graphs one sample of every supplier is shown. I tested ALL five samples, everyone of them has a very small spread in voltage and light flux. You can find raw data of this test here! Overall, there are interesting results because the voltage is very different from each other. The Mouser have a much lower Vf at same light flux, and therefore a significantly better efficiency – escpecially at high currents. I define the sweet spot as the position in the diagram which gives a good average between light flux, current and efficiency. In most cases it lays roughly 15 to 35 percent lower than maximum possible light flux. The spread of the both samples tested here is interesting. The Mouser sample performs a bit better and also reaches a higher current / light flux at much lower Vf. Important to know that the test setup, reflow procedure as well as timing and board was identical and was cross-tested with other Luxeon V samples from same suppliers. After the test up to 15 Amps the Luxeon V delivers approx 13 (@ 200 mA) to 3 percent (@ 1,400 mA) lower light flux at also a lower Vf than before. After ten minutes the efficiency and the voltage reaching its original level. I can reproduce this effect, i tested this five times. After several minutes on ultra high and high currents (15 to 10 Amps) the phosphor doesn’t look damaged in any way. 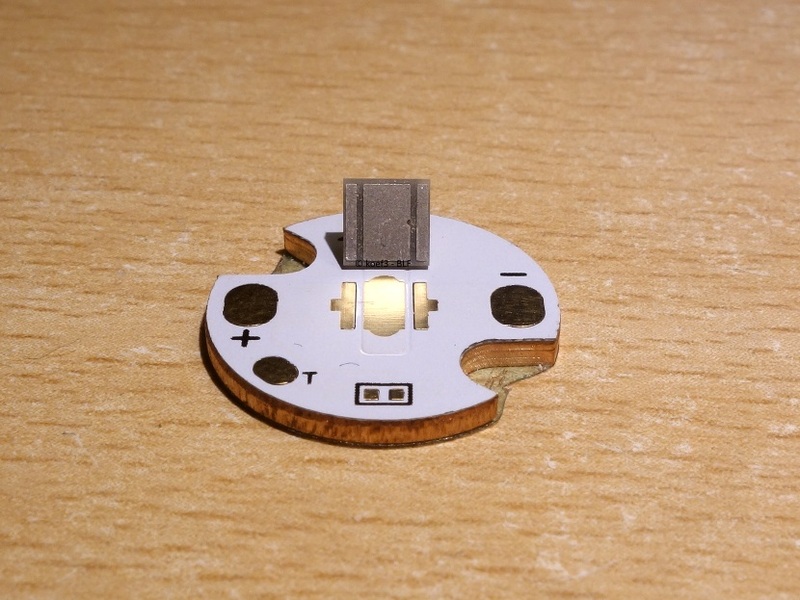 This LED seems to be much more sensitive in thermal characteristics than other Flip Chip emitters. The same possible maximum power on 4040 16 mm DTP boards and the lower max. Tj (temperature junction) stated in the datasheet is a clear sign that the maximum light flux is reached at much lower junction temperature than of other actual LEDs (XP-L2). Above 13 Amps the tint shifts slightly to blue, but much less. The SST-40-W is a very efficient LED, it reaches a lot higher light flux even at lower current but cannot deliver highest flux because of the weak bonding wires. It is important to know that the XP-L2 V5 40E (test here) shown in the diagram delivers not the flux bin stated by supplier and datasheet - but it delivers more flux than the V, but at a lot higher Vf. I established a new method for determining luminance, especially to ensure more realistic values for 'real-life' conditions (flashlight use). The measurements are taken with a new original Convoy C8 reflector, but with same heatsink / setup as previously used in flux measurement. LEDs marked with Warning sign uses old values are still taken with previous method (determining die size) due to problematic light distribution (donut holes etc). Dedoming (I tested only the shaving method) of the V (led4power sample) is absolutely not effective, which really surprises me. The luminance just increases by about 8 percent! In general, this LED is not suitable for thrower and ultra long range distance flashlights! I mentioned it earlier: because of the missing abnormal colored areas around the LES the beam is very nice, almost as good as you know it from the old XP-L or XM-L(2). From beam profile with an OP reflector it also looks very similar the XP-L or XM-L2. 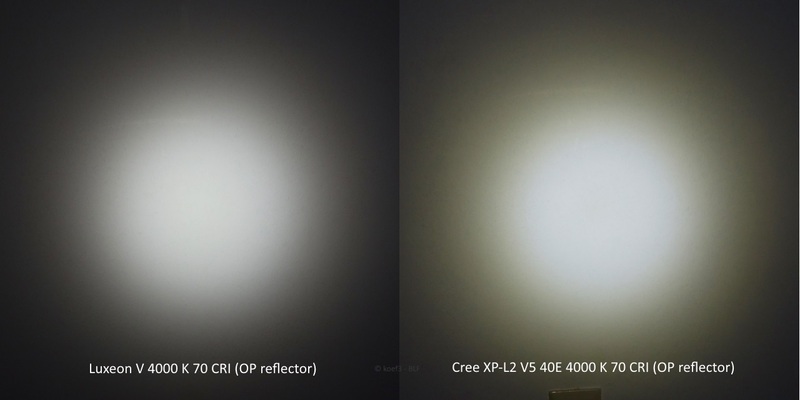 In comparison with the XP-L2 (which has a very annoying and visible yellow-colored corona) the difference is obvious. The tint is relatively warm, with no green or red in it. To be honest, a more reddish tint would be nice but the tint is almost completely fine to use it in standard flashlights. After dedoming (shaving) the color was a little bit warmer, maybe at 3800 K or so. The CRI is low, in direct comparison with a 219C R9050 sm405 the color rendition is not as good, but this should be ok for standard flashlight users. 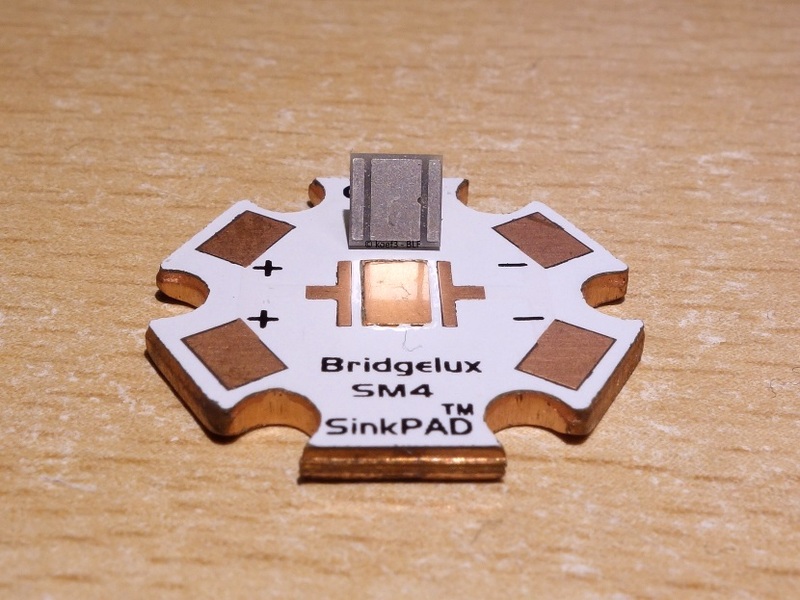 Overall, this LED is good for flashlight use despite using actual Flip Chip technology. The tint in the beam pattern is consistent and the tint has no green or yellow in it. Also the V delivers a lot of light at high currents, at low Vf (Mouser sample only). I don’t like the big differences in Vf and heat dissipation, and that the light flux at binning conditions is a little bit lower than stated in the datasheet / supplier. If you need an actual emitter with a nice (warmer or cold) tint and high power capabilities and the color rendition is negligible, the Luxeon V CSP might be the right choice for you! Mistakes, suggestions or offers / sponsoring of LEDs which I should test next are best sent via PM. Thanks for the invaluable testing koef3. Excellent work. Thanks for the thorough test. 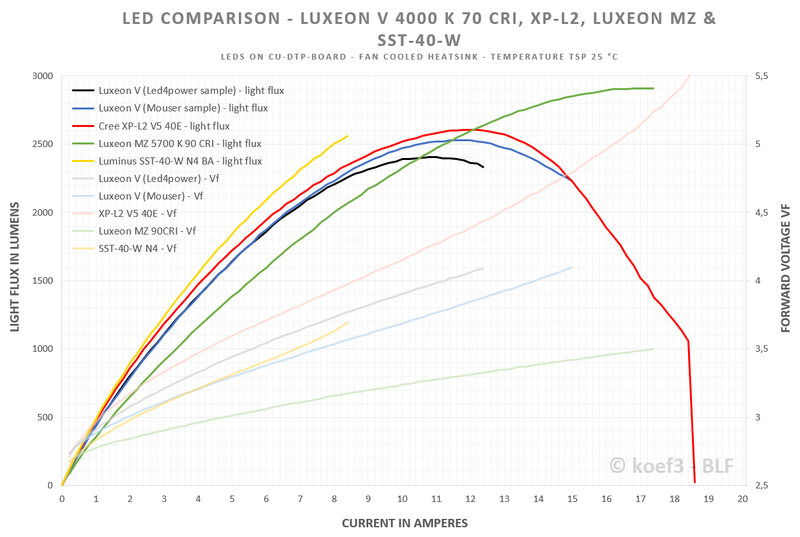 An observation if I compare this test with my test of the Luxeon V is that in my test situation I see the V maxing out at a lower current than you measure, suggesting that my cooling is less than in your set-up. It is something that was already found in a more extreme way when I tested the XHP70.2. Although it is 30mm diameter massive copper, the fact that the heat must travel 60mm through a pillar before being dissipated by the fins and fan in my led-mount apparently hinders cooling the really high power leds so much that at high current the performance is significantly affected. Two solutions for me, 1)build a better mount, 2)leave testing the highest powered leds to the other led testers. Another super detailed test! Nice! The luminance is very dissapointingly low. I will add your measurements to my luminance thread. How do you measure LES? Quote. "Without phosphor the pure LED chip has a LES of 6.19 mm² (0,009595 sq in)." That would mean die size is 6.19mm^2? That number looks too high, it should be 4mm^2. How do you measure LES? I also added the lighted side areas to the total LES. Lumileds on the other hand ignore these areas. For the die visible from top the claimed area is 'true', I got 4.01 mm² for this LES visible from above. For Lumileds maybe these areas don't seem to exist or they don't think that these surfaces emits any light which have an impact on the light pattern or luminance. Edit: You got this screenshot from Mouser 'Newest products'. Neither in the product brief nor in the official datasheet the die size of 4 mm² is stated. 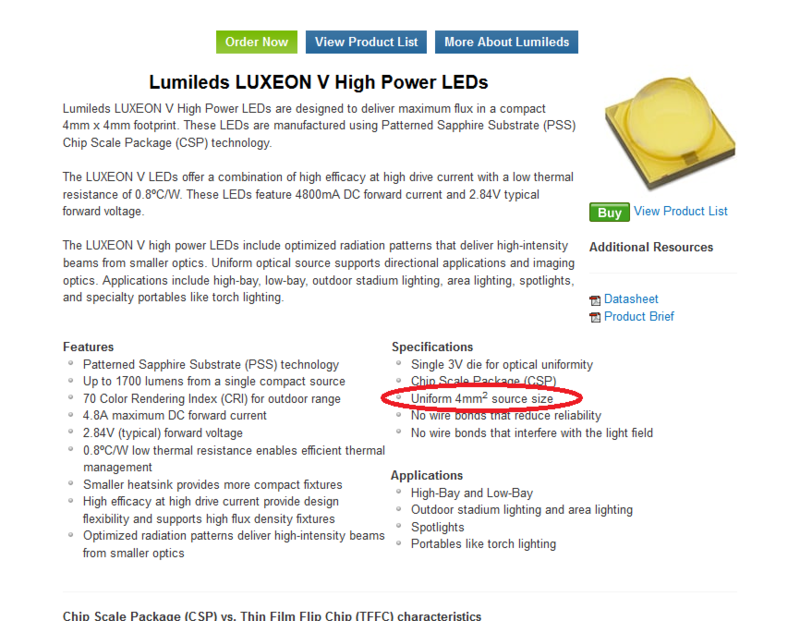 If I quick search for this phrase or the value '4 mm² Luxeon V' I got only your shop as reference - and the mentioned Mouser webpage. Ok, so you did measure top side as 4mm^2, so 4mm^2 die size is correct. But you can't just add side emitting surfaces to your LES calculation and expect correct cd/mm2, because things are not linear. You assumed that brightness intensity of light leaking form sides is equal to top side, this is generally not true. Also sides are not even in the same plane in 3D space. That means real luminance is higher that what you calculated because most of light is emitted from top 4mm^2. Best way to test luminance is with reflector or lens,as your numerical methods can be off by 30-50% easily because of mentioned non-linearities and 3D effects. Where is the manufacturer's source of 4 mm² light source / die size? I'm not sure what are you asking? 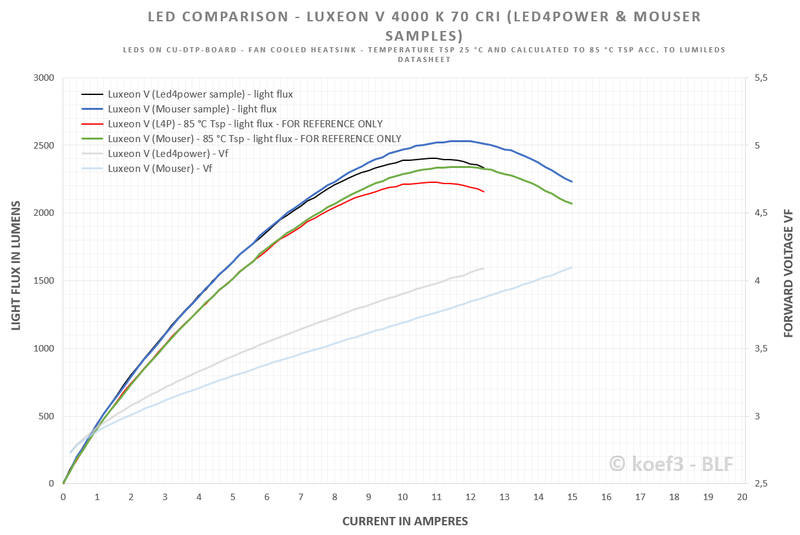 I updated the luminance values for all LEDs shown in test chart including the Luxeon V CSP (Led4power sample). 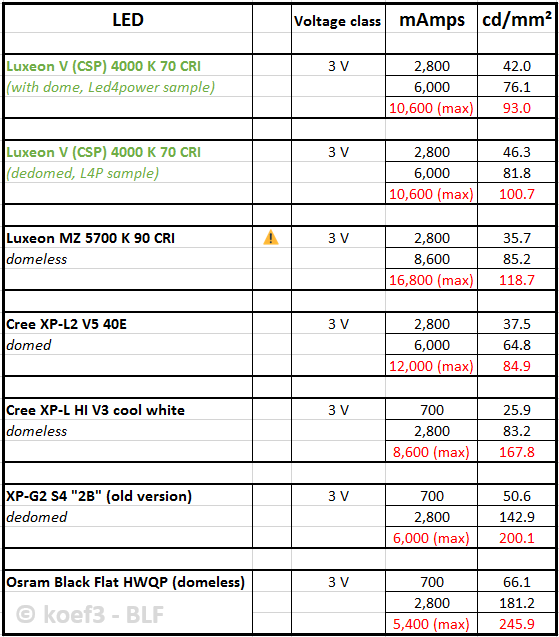 I could not update the luminance values for Luxeon V from Mouser because I ran out of samples. 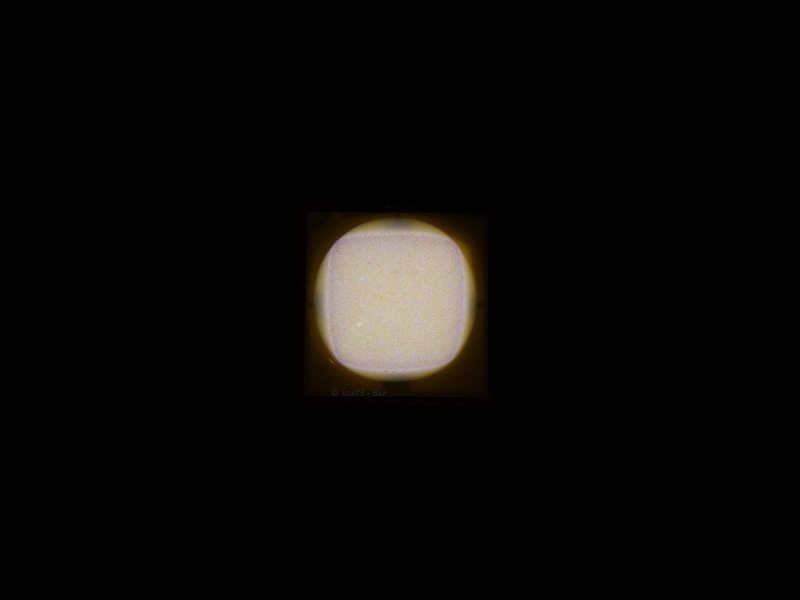 To ensure more realistic values for 'real-life' conditions (flashlight use / secondary optics) I established a new testing method to determine the luminance with a SMO reflector. All upcoming and already existing tests will use this method! Updating of my other tests will be done in the next hours / days. May I get raw charts for this LED as well? Unfortunately I have some other things to do, not just LED testing and writing in this forum. You'll see the raw data in the next days. Found some time, here are raw data! If you create diagrams / comparisons with this data, I would ask you to publish these charts in this topic to make it public to this great community and also to specify the source of the data used. Just one note: maybe it's better to specify Vf bins of tested LEDs instead calling it "Mouser", "Led4power" etc. because currently I have same Vf bin as Mouser (F bin), and I can't know which bin I'll have in future, neither can Mouser. Acc to my data and calculated to 85 °C Tj @ 1,400 mA (binning conditions) both samples corresponds to bin V (540 - 570 lm), not W. Other Lumileds emitters (Z ES, MZ, Rebel Display) reaches their stated flux binnings, also most other emitters from different manufacturers/vendors. For me, from this point measurement errors are very unlikely. In the next time I'll check the light flux / Vf vs Tj, like in other tests already done. It seems likely that both emitters from different vendors have the same voltage and flux bin, namely G and V.